On the Martin Luther King Jr. national holiday, Emory takes a "Day On" instead of a day off, with volunteers helping with community service projects across Atlanta. 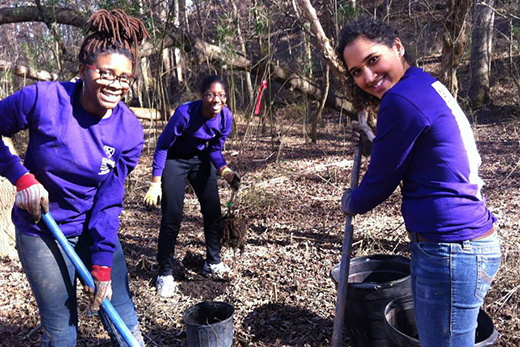 Here, students plant trees for Trees Atlanta during the 2015 event. Photo courtesy Volunteer Emory. The new year brings new fun and affordable experiences around campus, including opportunities to see "brave new" exploratory theater works and join in community volunteerism for this month's Martin Luther King Jr. Day of Service. 1. Travel with "Bill and Pete" in Artful Stories at Carlos Museum. Youngsters — or even the young-at-heart — can travel the Nile River with Bill the crocodile and his bird-toothbrush Pete in this Tomie de Paola story set in Egypt. Children ages 3 to 5 years old are invited to join a parent or adult to sit among works of art in the Egyptian Galleries for this special story time experience on Saturday, Jan. 9, from 10-11 a.m.
Hunt for images from the story, like the sacred blue water lilies, in the Egyptian galleries before heading downstairs to make paper crocodiles. The program is free, but space is limited. Make a reservation by calling 404-727-0519 or emailing avuley@emory.edu. 2. Cheer on Emory's basketball teams. 3. Catch a French New Wave film — or four. This semester, Emory Cinematheque hosts the "French New Waves: Classics and Rediscoveries" film series, with screenings every Wednesday at 7:30 p.m. in White Hall Room 208. Showings are free, with no tickets or advance registrations required. Films are subtitled in English. January's line-up includes "Bob Le Flambeur" (1956) on Jan. 13; "Les Cousins" (1959) on Jan. 20; and "The 400 Blows" (1959) and "Antoine and Colette" (1962) on Jan. 27. 4. Take a "Day On" instead of a day off to honor MLK Jr.
Martin Luther King Jr. Day — Monday, Jan. 18 — is a university holiday, but don't just take a day off. Instead, join Volunteer Emory for "Emory's Day On," and spend the day with local service organizations addressing a range of social justice and community issues. The full list of projects for this year is still being finalized, but will be posted online with links to register. 5. Explore "Ethics on the Stage" with the Alliance Theatre's "Disgraced." Winner of the 2013 Pulitzer Prize for Drama and a Tony Award nominee for Best Play, "Disgraced" takes the stage at Atlanta's Alliance Theatre from Jan. 27 to Feb. 14. Soon to be an HBO movie, the play tells the story of Amir Kapoor, a successful lawyer who is rapidly moving up the corporate ladder while distancing himself from his Muslim roots. When Amir and his wife, Emily, host a dinner party, friendly conversation quickly explodes into something far deeper and more dangerous. On Tuesday, Jan. 19, Emory's Ethics and the Arts Initiative will host a free, interdisciplinary discussion of "Disgraced" as part of its "Ethics on the Stage" series. The event takes place at 7:30 p.m. in room 102 of the Center for Ethics. 6. Attend a "Worm and Fuzzy" or "Troy Story" lecture. Being part of a university community means having almost unlimited access to lectures and seminars on a wide range of topics — from humanities to human health, and everything in between. The start of the new semester brings a variety of opportunities to learn more about areas that interest you. These diverse lectures stand out based on their creative titles, which prove you can have fun with even serious topics, but you will find more options on the full Emory Events Calendar. "'Worm and Fuzzy' — Exploring Controversies in Appendicitis": Mehul V. Raval, assistant professor of surgery, presents the Jan. 21 installment of the popular Surgical Grand Rounds series. Lectures are open to all and held on Thursday mornings from 7-8 a.m. in the Emory University Hospital Auditorium. "Troy Story: Miniaturizing Epic in Roman Art": Michael Squire, reader in classical art at King's College London, delivers the fifth annual Herbert W. Benario Lecture in Roman Studies on Thursday, Jan. 21, from 7:30-8:30 p.m. in the Reception Hall of Michael C. Carlos Museum. 7. Enjoy a lunchtime concert of Schubert's "Wintereisse." "Wintereisse," Franz Schubert's great song cycle, was created as a setting of 24 poems by Wilhelm Muller. This month, hear it sung by bass Daniel Cole, with William Ransom, piano, at a free John and Linda Cooke Noontime Series Concert presented by the Emory Chamber Music Society of Atlanta. The concert will be Friday, Jan. 22, at noon in the Michael C. Carlos Museum Reception Hall, but be sure to arrive early as seats always fill quickly. 8. Get caught up in "CelloMania!" Cello fans won't want to miss this free Emerson Series Concert, which brings together the talents of six cellists performing everything from solos to sextets. Cellists Chris Res, Guang Wang, Roee Harran, David Hancock, Lexine Feng and Charae Krueger will perform for CelloMania! in Emerson Concert Hall at the Schwartz Center for Performing Arts on Sunday, Jan. 24, at 4 p.m.
9. Experience "Brave New Works" of theater. Set for Jan. 28 through Feb. 13, Brave New Works 2016 highlights the wealth of talent in Atlanta's own backyard. Professional playwrights, adaptors, composers and directors, gather at Emory to work on new scripts with a combined company of student and professional actors. Performances take place in the Theater Lab of Schwartz Center for Performing Arts. All events are free and open to the public, but reservations are requested. Reservations can be made by following the event links on the Arts at Emory calendar. Thursday Fellowship Series: Jan. 28, 7 p.m. Three finalists for Emory's 2016-2018 Playwriting Fellowship present readings of their work with the Brave New Works Company. "The Younger": Jan. 29, 7 p.m.: Written by Ann Hughes 17C as part of the Fellows Project, which identifies and mentors a promising Emory student playwright who has completed the first draft of a full-length play, culminating in a staged reading during Brave New Works. "Shaking the Wind: Firebreathing": Jan. 30, 7 p.m. Written by Minka Wiltz and directed by Tom W. Jones II, this second installment of "Shaking the Wind," the story of a girl raised by an Atlanta street preacher, explores how Margie became Minka and defied her brainwashing to become her truest self. "Please": Jan. 31, 2 p.m. This stage adaptation of Jericho Brown's American Book Award-winning collection of poetry explores the intersections of love and violence, African American male identity and sexuality. "Please" was adapted by Brown and Snehal Desai, who directs. 10. Read along as "Babar the Elephant" is set to music. Bring your own book and follow along as Jean de Brunhoff's classic tale is set to beautiful solo piano music by Francis Poulenc, performed by pianist Elena Cholakova and narrated by the legendary voice of classical radio in Atlanta, Lois Reitzes. Part of the Emory Chamber Music Society of Atlanta's Family Series, this free concert takes place Sunday, Jan. 31, at 4 p.m. in the Michael C. Carlos Museum Reception Hall.